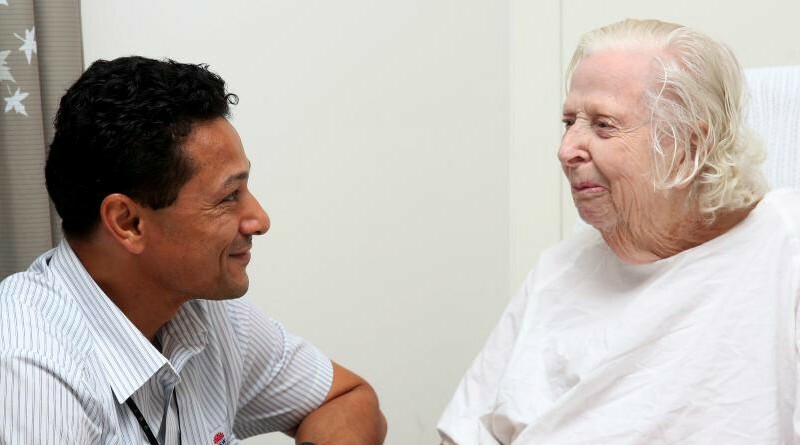 Nursing unit manager Darryl Peterson speaks with patient Norma Abbott, who has said she has felt unsafe in the past. Blacktown Hospital’s social work department celebrated positive ageing while raising awareness for elder abuse on World Elder Abuse Awareness Day this month. Blacktown Hospital’s social work department manager Bobbi Henao Urrego said it was an opportunity to come together with the community and pay tribute to our older families, friends and carers. “With support from the NSW Elder Abuse Helpline and Resource Unit, we provided written information in a variety of languages,” she said. The World Health Organisation estimates that the abuse of older people sees 1 in 6 affected. This can happen in a number of differing ways including financial; psychological and physical abuse. It is important that when looking at violence prevention, the ageing population not be excluded.